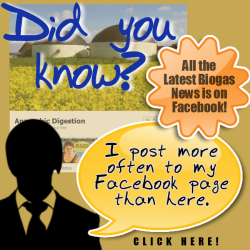 The following article is an explanation of the options for Anaerobic Digestion Plant Digestate Enhancement, (Fibrous Biogas Digestate), which were reviewed by Pell Frischmann Consultants when they produced a report for WRAP in the UK, on the subject of Biogas Digestate Enhancement and Treatment Techniques, in 2012. It includes an updated background to the use of digestate in the UK. The reason for the report was to look at all the available options for fibrous digestate enhancement, with a view to achieving the most economic, if not the most profitable methods for fibrous digestate sale or disposal. The use of biogas digesters for the treatment of sewage sludge with the benefit of generation of renewable energy, is now well on its way to becoming the normal practise in the United Kingdom, and a number of other nations. However, the use of biogas digesters for organic wastes from other sources such as food waste has much less of a proven track record. In fact only in 2011 there were concerns that wholly food waste fed anaerobic digestion plants might not be viable in the long term due to process instability problems. This perceived barrier has been removed by the results of research by the University of Southampton, but this example just goes to show how recently the research was all about whether this type of biogas digester would work reliably. Wind the clock forward to today, no more than 2 to 3 years afterwards, and many food waste AD plants have already been commissioned. The end-result has been that there has been very little research work done on digestate enhancement, when compared with other aspects of biogas production. However, 90 to 95% of the original feed material re-appears as digestate from the digester, and if the digester is running correctly the mass reduction is simply the mass of the biogas produced. How any AD Plant handles digestate is therefore of huge significance to plant operation and to the economic viability of each plant. 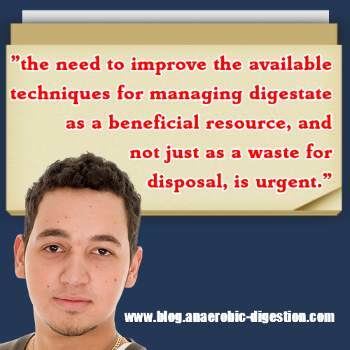 With the undeniable increased popularity of waste digestion, the need to improve the available techniques for managing digestate, as a beneficial resource, and not just as a waste for disposal, is urgent. The next frontier for Anaerobic Digestion will be the optimization of digestate by enhancement techniques, and treatment, to provide access for this material to much wider and more profitable markets. The study set out to identify technologies and techniques that both can be applied to digestate, and will also lead to benefits in its disposal. The options available from straightforward thickening/ dewatering to the development of new products, were listed and explored. A number of examples of the use of new technologies for biogas digestate enhancement have also been included in the report, and can be seen at the above link. Some of these techniques include a number of novel and emerging techniques for both liquid and fibrous Biogas Digestate. Thickening by belt thickener equipment and by Centrifuge, dewatering by using a belt press, or centrifuge, or Dewatering using a hydrocell, or a Butcher press. Finally, dewatering Fibrous Biogas Digestate by Electrokinetics, and Purification by Ultrafiltration and Reverse Osmosis. Composting, Reed Beds, Biological Oxidation, Biofuel Production (Algae), Biofuel Production (liquor as process Bioethanol), Biofuel Production (hydrolysis of fibre to Bioethanol), or Microbial Fuel Cell. Struvite precipitation, Ammonia recovery (Stripping + Scrubbing), Ammonia recovery (Membrane Contactor), or Ammonia recovery (Ion Exchange), and finally the option of Acidification. The above are all technologies which the study team identified that are either being applied to biogas digestate or have potential to be applied to digestate. The authors point out that all digestate treatment systems will be very site-specific, with no single system which will be optimal for all digester sites, asnd that usually the listed technologies will be used in combination, rather than individually. In the study it is made clear that, so far, in the UK the uptake of digestate enhancement technologies has been slow. It was not clear to the author of this article where the digestate is going in the absence of these enhancement techniques. The research study concluded that presently there are a big variety of choices readily available for digestate treatment and recovery. Nevertheless, the most significant obstacle in the UK is the existing expense of setup, and the ongoing running costs, related to these innovative technological applications. Eventually, the type of treatment employed to provide the most economic recovery path will certainly depend upon a number of factors, including whether its a Liquid or a Fibrous Biogas Digestate. Plus, the level of enhancement desired/ needed, and the available markets for digestate products and the accessibility of land-spreading markets. This article is based upon an article in the CIWM Magazine (June 2013 edition) by Pell Frischmann Consultants, who during 2012 completed an extensive desk-top study on digestate enhancement and treatment techniques for WRAP.